When you buy this cookbook, you get the really cool ice saber molds and that's probably enough for a lot of you. Because the ice pop molds are really just that cool. The book has 30 recipes for frozen treats. 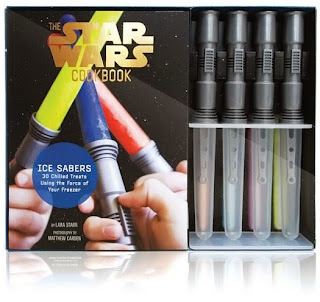 There are only 3 recipes for ice pops in Darth Vader Red, Obi-Wan Blue and Luke Green. The rest of the book is easy to make recipes inspired by the movies. My daughter, who has strong cooking skills, really likes Chewie Chocolate Cheesecake Pops. This is one of the recipes that doesn't look like something from the movies, but each step is explained well and they are easy to make. A basic chocolate cheesecake without a crust is baked, frozen, cut into pieces and dipped in chocolate. Sometimes the tie between the movie and the dessert is a catchy, rhyming or punning name such as Bananakin Splits or Tauntun Bon Bons. Other desserts like Ice Cream Clones look like something from the movies. The Twin Suns Sherbet Bombe is my favorite visually, it's simple to make and stunning. The name that had me laughing out loud is the incredibly refreshing citrus Mos Icely granita which is also my favorite recipe in the book. So a fan, especially a younger fan who is learning to cook, would enjoy the cookbook. The recipes are simple and really nice for a hot summer day. The recipes are clearly written by author Lara Starr, and the photographs by Matthew Carden are just delightful, featuring lots of action figures with the various desserts. It's a soft cover book in full color. The molds! One cup of liquid is enough to fill all 4 molds with a couple tsps left over. The molds stand easily in a fridge and the pops release easily after running a bit of warm water over the mold. 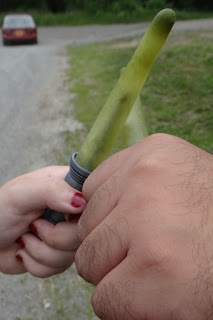 They are fantastic, and I think even adult fans won't be able to resist crossing ice pops at least once. The recipes use American volume measurements. Published by Chronicle Books- check out their Facebook page for contests and more information about their books. You can get the set using my Amazon.com affiliate link. I'll make a small commission if you use the links below which helps pay for this site.